VFD technology is not new to the HVAC industry. Variable frequency drives have been used extensively for air handling unit fans, cooling tower fans and water pumps for a long time. With state-of-the-art compressor technology and microprocessor based control systems, manufacturers now offer variable frequency drives specially designed for centrifugal chillers. Application of variable frequency drives to centrifugal chillers requires a control strategy that understands centrifugal chiller and VFD operations. With advanced microprocessor control technology, the integration of variable frequency drives in the special efficient offerings is but a natural step. Typical ARI conditions are 44/54°F chilled water and 85/ 95°F condenser water temperatures. ARI also specifies Integrated Part Load Values (IPLV) which take into consideration the part load capacity operation of the centrifugal chillers with varying entering condenser water temperatures. One such standard used for centrifugal chillers is ARI Standard 550/590-98. 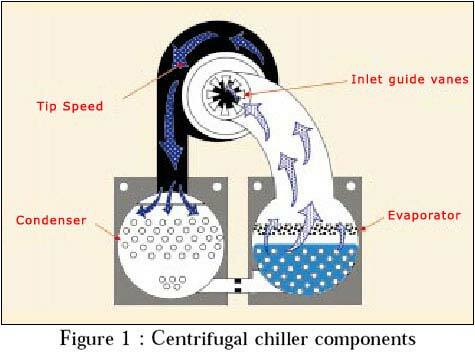 Although, this standard provides a commonly used formula to calculate the operating costs for the centrifugal chiller during its life span, the operating characteristics may not be realistic for every application particularly for South East Asian countries (this standard allows 65°F minimum entering condenser water temperature). How does variable frequency drive save energy? Controlling two mechanics saves energy - impeller tip speed and inlet guide vanes. 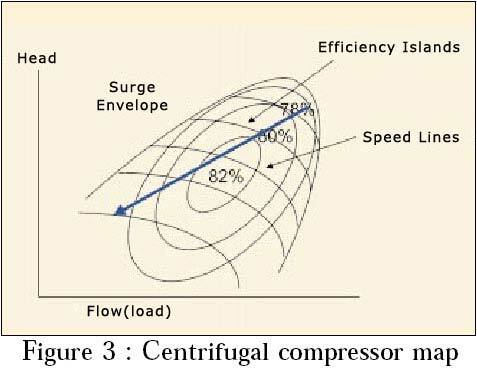 A centrifugal compressor performance relies on the impeller design tip speed, which is the tangential velocity of the refrigerant at the edge of the impeller wheel when it leaves the impeller (Figure 1), to increase the refrigerant pressure between evaporator and condenser. 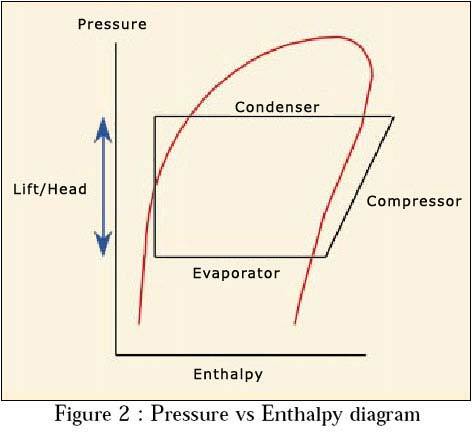 This pressure difference created between the evaporator and condenser is called 'lift' or the 'head' (Figure 2) that the compressor must create to move the refrigerant through its cycle. The head depends on many parameters such as chilled water and condenser water temperatures and also the fouling factors. Impeller speed is directly proportional to the head created. Obviously, greater the head, higher the energy input and hence higher impeller speeds. However, the head conditions may change with a change in load pattern and outside ambient conditions (reduced condenser water temperature). Constant speed VFD in this case will over-accelerate the refrigerant as it leaves the impeller, resulting in a waste of input energy. Variable frequency drives reduce the compressor speed as the head drops and move the compressor into a higher efficiency region in the compressor map, often allowing the compressor to operate more efficiently than at the full load condition. In a fixed speed centrifugal chiller, inlet guide vanes are used to throttle refrigerant at the inlet of the compressor to vary the compressor capacity. When the guide vanes move from fully open to slightly closed, compressor efficiency can actually improve because the guide vanes 'preswirl' the refrigerant entering the impeller. As the vanes continue to close, however, the vane action quickly becomes a restriction, losing the pre-rotation effect and reducing the compressor capacity and efficiency. Variable frequency drive slows the compressor to match the head conditions, without closing the guide vanes. Keeping the inlet guide vanes open improves the compressor operating efficiency. The classic way to explain variable frequency drive is to relate fan laws to the centrifugal compressor. Therefore, every single unit drop in RPM will reduce the HP of the motor by the cube root. Hence, the compressor input HP drops to 73% at 90% and 42% at 75% loads respectively. Having both inlet guide vanes and speed control allows more flexibility to the centrifugal chiller operation and gives the ability to keep the compressor within the best operating range on the compressor map (Figure 3). Open type compressors have an added advantage with variable frequency drive as lower ECWT (Entering Condenser Water Temperature) operation is possible as compared to semi hermetic designs. Multistage compressors have the added complexity of maintaining the appropriate inter-stage pressure, usually through operation of one or more sets of inlet guide vanes. The individual impellers are matched, based on the design operating speed of the impeller. Varying the speed will upset this balance and this will penalise the performance of the compressor. How does variable frequency drive work? The variable frequency drive needs a lot of information to work. Variable frequency drive has to continuously monitor several operating conditions such as chilled water temperature, chilled water setpoint, refrigerant pressures, prerotation vane position and the actual motor speed (figure 4). This information is then fed to a microprocessor that determines the most efficient way to operate. It optimises both motor speed and the pre-rotation vane position and changes the frequency of the power input to the motor, in order to consume the least amount of energy. To calculate the operating cost of a centrifugal chiller during the full year, all the operating conditions such as condenser water temperatures as well as cooling load should be considered. One can simulate a computer model to compare the operating costs. A 5 Star hotel was considered in China for a 450TR centrifugal chiller with and without the variable frequency drive. Realistic centrifugal chiller running conditions based on China weather data was considered for the comparison. Since this centrifugal chiller was one of the two in the plant room, we chose this centrifugal chiller to modulate to take care of the part loads. Also the cooling tower water temperature was allowed to drop according to the weather data as well as heat rejection from the centrifugal chillers. The capacity and the number of hours of operation were considered at 10% capacity intervals with varying entering condenser water temperatures (Table 1). Alt1 is for the centrifugal chiller with constant speed and Alt2 is for the variable frequency drive centrifugal chiller. Comparing the costs over the year gives a saving of 187,875 kWh units with the variable frequency drive. Taking electricity tariff as $5 per kWh, this equates to annual savings of $0.94 Million. The total savings will be even higher if demand tariff costs are considered. With a variable frequency drive, power is initially applied for start-up at a very low frequency, which when gradually increased, allows little motor slip. The result is a high torque per amp of current minimising the extra amps required to start the motor. Therefore, the inrush amps for variable frequency drive never exceeds the 100% FLA of the motor. 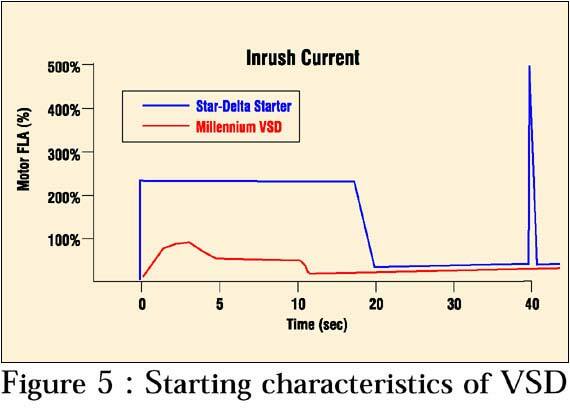 Other soft starters such as Star Delta or Solid State starters have 200-400% FLA as the inrush amps at the start-up (Figure 5). This makes variable frequency drive an ideal starter particularly for applications with limited inrush capabilities such as emergency generator systems. Also the generators and cabling can be down sized, as they do not have to incorporate extra capacity required for the start-up. 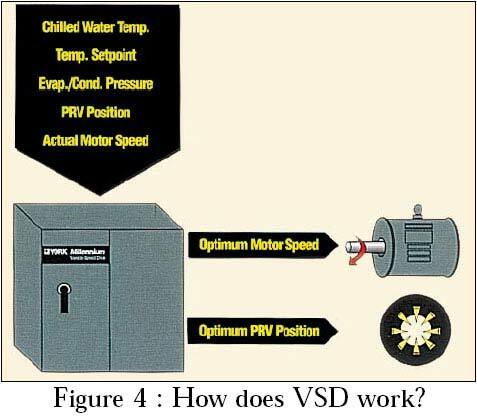 Addition of variable frequency drive enhances the unloading capability of a centrifugal chiller by varying the speed prior to closing the guide vanes. This allows better tracking of low load conditions. This also eliminates unnecessary cycling of the centrifugal chiller resulting in reduced maintenance and better control of the chilled water loop. Smooth starts enhance the motor and compressor life. Most of the noise generated by the centrifugal compressor is due to the refrigerant discharged at high velocity into the condenser. Slowing down the compressor reduces the discharge velocity at low heads and hence reduces noise. Variable frequency drive gives automatic power factor correction to at least 95% at all operating conditions. A normal centrifugal chiller or screw chiller has a power factor of 0.85 at 100% load which further reduces at part load and can go down to as low as 0.60.Many utilities require correction, or impose financial penalties when operating with lower power factors. 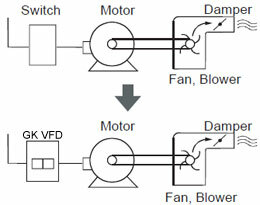 Most centrifugal chillers with variable frequency drive option will have factory installed variable frequency drive, saving in-field installation costs (figure 6).A field retrofit variable frequency drive can either be installed on the centrifugal chiller or near the unit in place of the starter. In the real world, energy performance at real world conditions has little to do with bottom line energy costs - what happens at off design conditions is much more important. Even with a relatively warm temperature in China, VFD energy savings of $0.94 Million were possible when compared to a fixed speed drive or even for that matter any positive displacement compressor like a screw chiller. This makes an excellent opportunity to attain quick payback and return on the VFD investment, particularly for facilities operating continuously such as hotels, hospitals, call centers, software centers and factories. 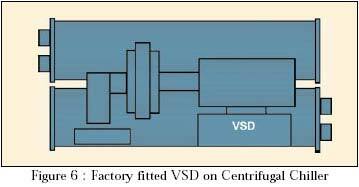 VFD on centrifugal chillers is being used by most of the major centrifugal suppliers as new equipment offering or retrofit option. Considering the ever increasing cost of electricity ,it's a wiser choice to opt for energy saving options like VFD on centrifugal chillers. Can we add VFD to any existing chiller?